Records for New England are being set this winter on the snow front. January tallies haven’t just surpassed previous snow records–they’ve obliterated them. In the New York City area, where an 8.1 inch total is considered normal to date, snow totals have reached 3 feet and Central Park’s 36.0 inch month to date tally has eclipsed the 86 year old previous record of 27.4 inches set in 1925. Despite these snow levels “onshore”, Cape Cod and even more so Brewster have received only moderates amounts of snow making your winter getaway to Cape Cod especially appealing. 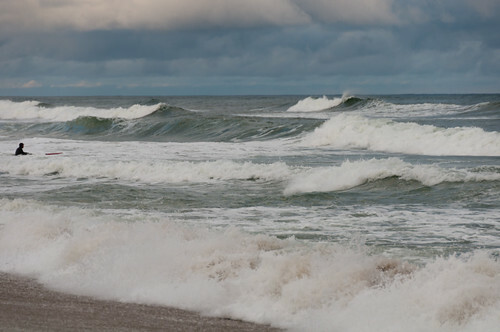 One of our favorite winter beaches on Cape Cod is Nauset Beach. You can walk for hours and be lost in the sounds of the waves crashing into the shore line. Our faithful companion Harrison loves to go swimming and does not seem to mind the rather frigid temperatures this time of the year. At our romantic Cape Cod bed and breakfast, Brewster by the Sea Inn and Spa, we always tell guests that this is the best time of year to walk on the beach. There is something so magical about the quiet. This past visit there were several surfers enjoying the rather rough seas. Harrison loves to chase seagulls and be chased by other dogs. He never catches seagulls, but is so fast that other dogs never catch him. 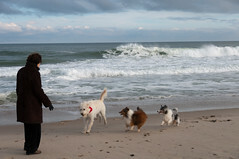 It was a magical day, as most are, on Nauset beach and we hope you enjoy the the winter beach pictures on flickr. This entry was posted in Uncategorized and tagged Bed and Breakfast, Brewster By The Sea, Cape Cod, Cape Cod National Seashore by Amy Chesnut. Bookmark the permalink.